The Cortisol kit is intended to quantify hydrocortisone from cells, serum, and liver microsomes. Cortisol, also known as hydrocortisone, is the major glucocorticoid produced and secreted by the adrenal cortex. It is involved in regulation of glucose metabolism, fat degradation, blood pressure levels, and stress inhibition. Cortisol also diffuses into cells, where its level is highly regulated by 11ß-hydroxysteroid dehydrogenase (type 1 or 2). The cortisol assay allows for rapid and accurate cortisol measurement, even in complex samples such as liver microsomes, whole cells, and animal serum. This assay can also be used to assess 11ß-HSD1 activity (native, recombinant, or microsomal). 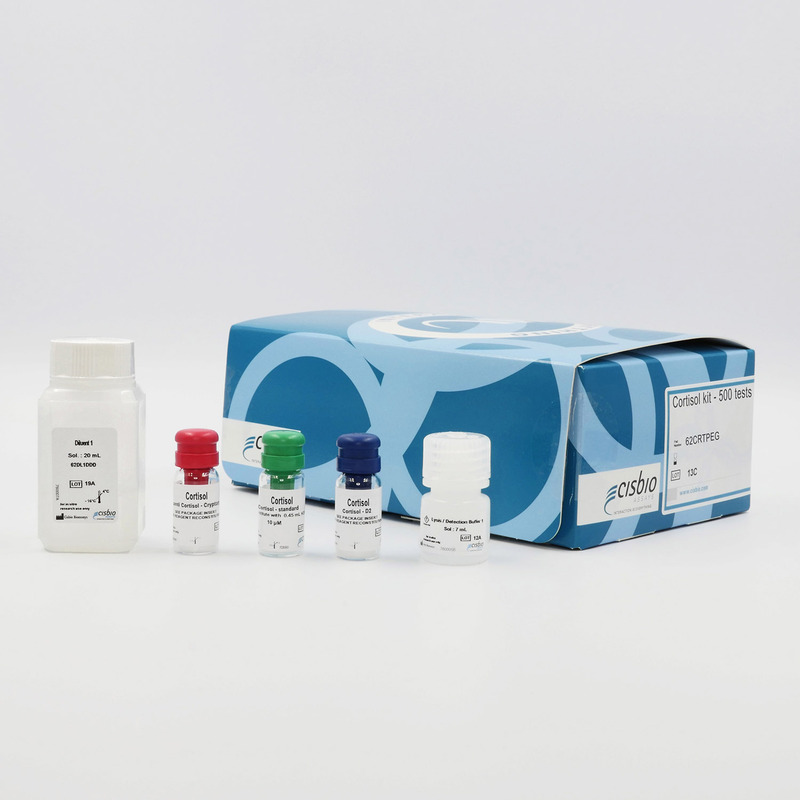 The kit is based on a competitive format involving a specific antibody labelled with Cryptate (donor) and cortisol coupled to d2 (acceptor). Cortisol produced by cells competes with d2-labelled cortisol for binding to monoclonal anti-cortisol Eu Cryptate. - Cortisol detection using HTRF reagents. This protocol requires only a single, two-hour incubation period following cell stimulation. The cortisol kit is intended to accurately measure hydrocortisone in complex samples such as serum, cells and microsome preparations. Figure 2 summarizes the results of a microsomal 11ß-HSD1 assay performed using HTRF cortisol reagents in low-volume 384-well plates. Known inhibitors of 11ß-HSD1, Carbenoxolone and Glycyrrhetinic acid, blocked the conversion of cortisone into cortisol. IC50 values were 0.33 and 0.31 µM respectively. Microsomal 11ß-HSD1 (0.2mg/mL) was stimulated by NADPH (200µM) and cortisone (160nM) in a 384 low-volume plate. Various concentrations of the Glycyrrhetinic acid and Carbenoxolene inhibitors were added. A standard curve with known cortisol concentrations was run concomitantly. Plates were incubated for 2 hours at 37°C and then a cortisol-d2 conjugate and Eu3+ Cryptate labeled anti-cortisol antibodies were added. Plates were incubated at RT for 4 hours after reagent additions and emissions read at 620 and 665 nm.